For 2011, the Hyundai Genesis 4.6 sedan comes standard with the Technology Package, which includes a Lexicon surround-sound audio, Ultimate Navigation featuring a larger screen, smart cruise control, electronic parking brake, cooled driver seat, adaptive front lighting with HID headlamps, and parking assistance. 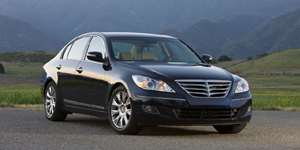 Find the used Hyundai Genesis of your choice from a dealer in your area. Search our used car listings now.